Empower your teams that use Zendesk, Freshdesk, Kayako, Desk, Groove, or HappyFox and Visual Studio Team Services & Team Foundation Server & Azure DevOps. Keep up and stay connected. Know the state of your tickets on both sides. Choose your own criteria for custom integration. Adapt to Microsoft Processing Templates. Stay relevant to team projects. Manage auto-synchronization. Build your own rules to import and to synchronize tickets content. Overview of ticket management across projects, work items for non-technical personnel. Whether you work with new or old tickets, always stay up to date. 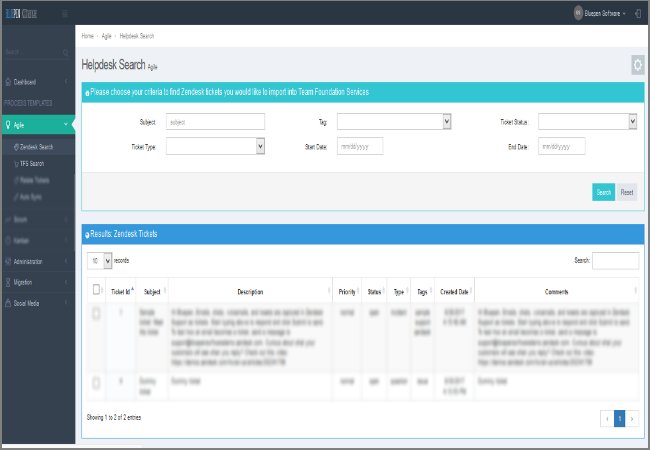 View, Search, and Filter Imported / Unimported Tickets. Personalize your organization's experience. Manage your own work. Scan Team Services / Help Desk Systems setup. Leverage configuration for integration accuracy. Manage multiple projects with Team Services On Premise. Manage Custom Fields for VSTSO / Azure DevOps / Team Foundation Server. 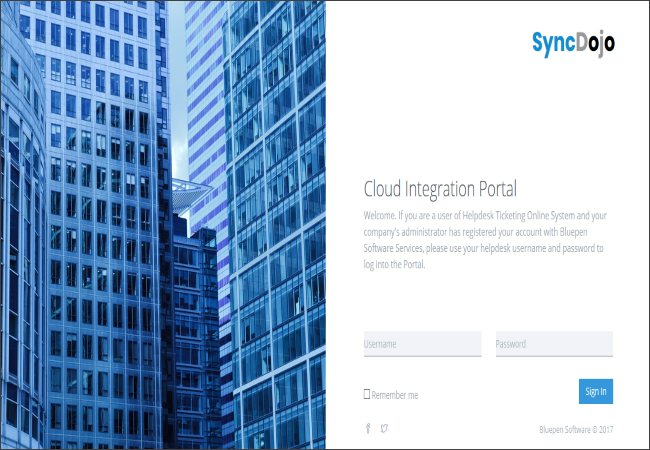 Register through Cloud Integration Portal. To integrate, get your necessary end points and accounts ready for help desk and management systems. 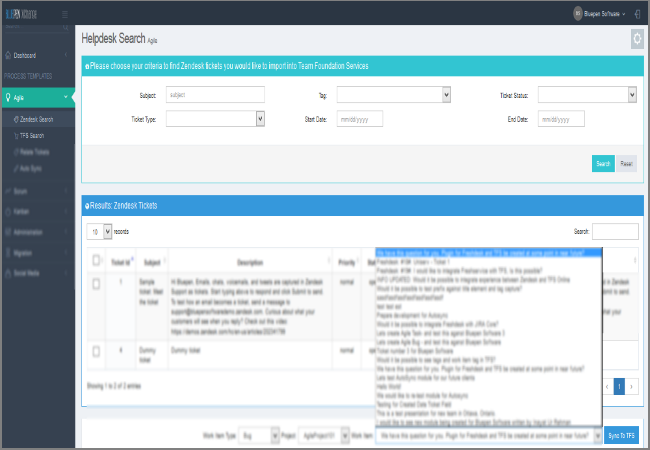 Search existing help desk tickets that have not been imported and synchronized yet using different search criteria filters in your Help Desk. Pick and chooce how many tickets you would like to import and in which work item type: Requirement, Product Backlog Item, User Story, Bug or Task. Perform Bi-Directional synchronization based On-Demand / AutoSync. 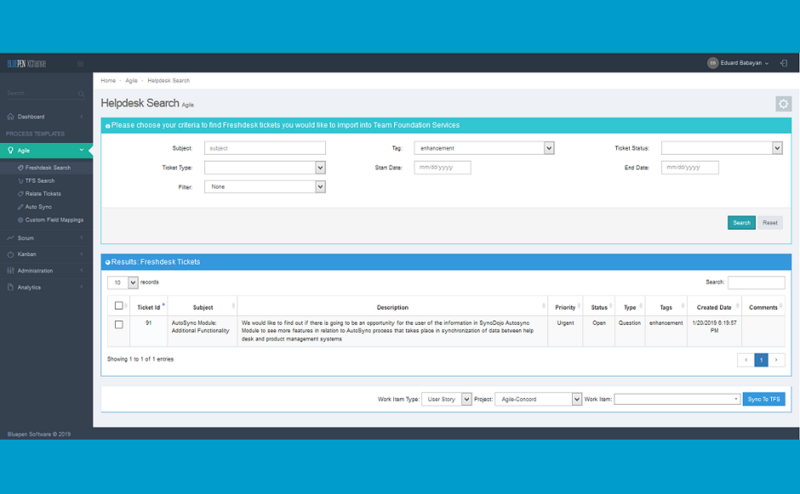 Relate existing work items and existing help desk tickets in Agile, Scrum and Kanban templates. As you set yourself on a journey to improve your collaborative efforts between customer support and product management, look no further than your teammate, Administrator who has knowledge and experience with your Help Desk system and Team Foundation Server or Team Services Online. Collect necessary information when it comes to making a handshake with your Help Desk system and Product Management system to create in-house integration space where Development and Support work together cohesively as a single transparent unit of work. Dive into learning more about your teams performance while you query and analyze what is happening with ticketing data in relation to development efforts taking place in other teams. Keep your senior staff members in both teams informed and aware about potential new requests, issues or bugs that co-relate to already existing work or the work that is coming in the pipeline. 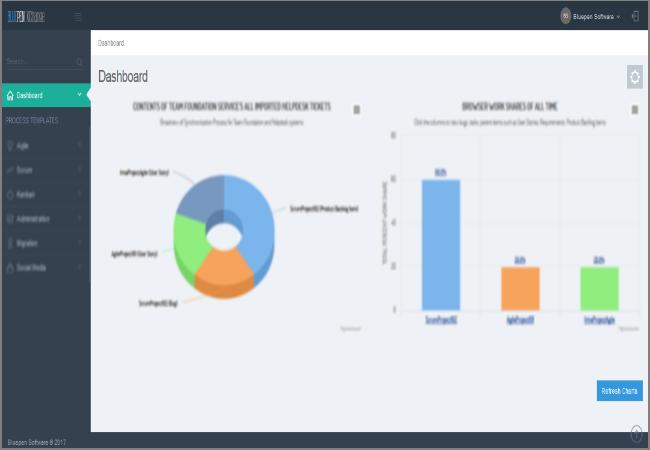 Maximize your teams performance by looking at real-time charts that reflect the results of autosync importation and synchronization efforts produced by you using SyncDojo Cloud Integration Portal. Stay informed and stay connected with your teams. 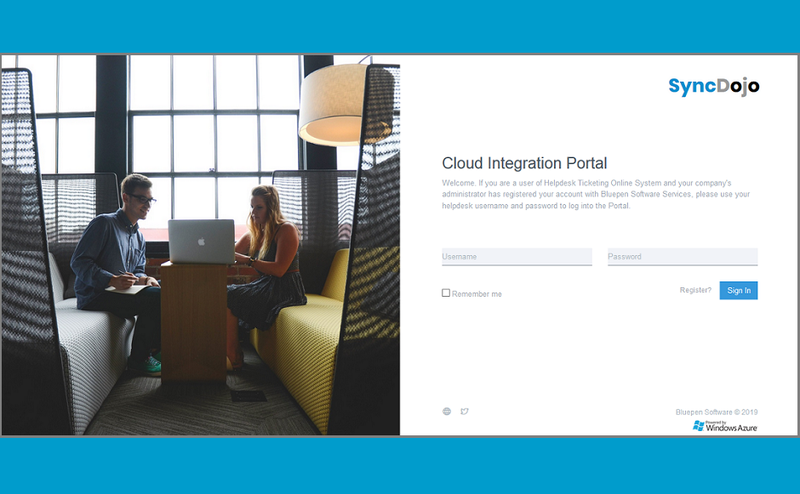 Involve more people as you expand your work in the cloud integration space. 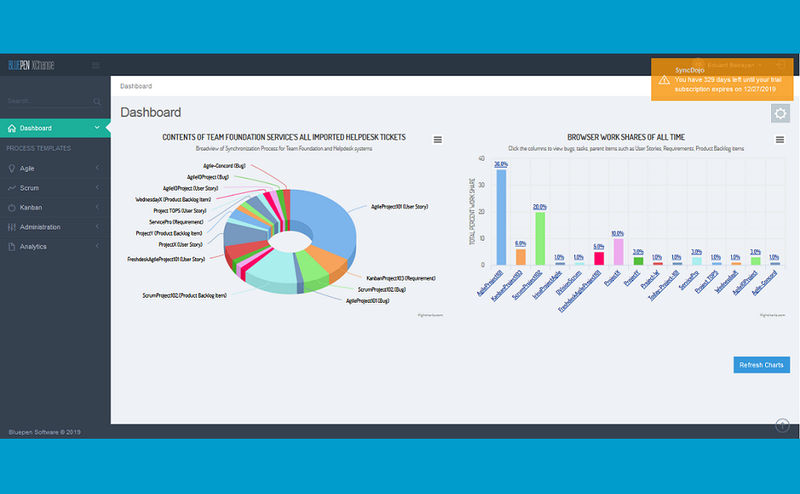 Dive into ticket analytics and see how best to redistribute your work force in relation to projects and time. 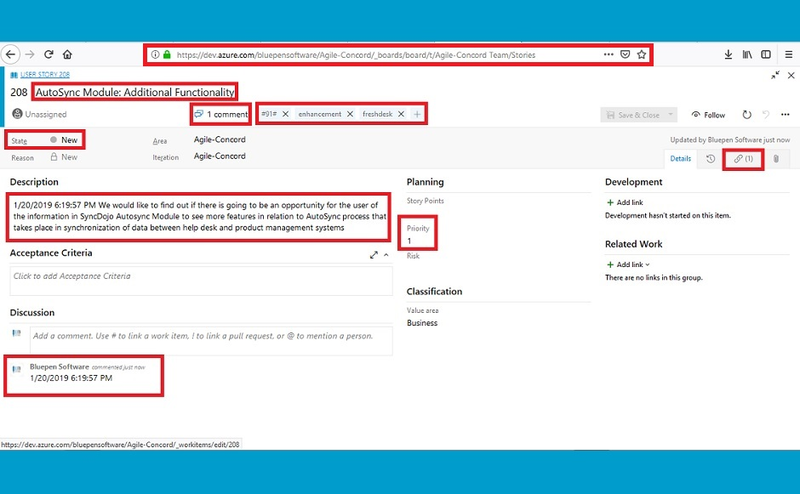 Aggregate your data by projects, work item types within different Azure DevOps Templates: Agile, Scrum, CMMI. Inform your C-level executives how collaboration performs between teams and departments within your organization whether you use laptop, pc station or tablet PC.